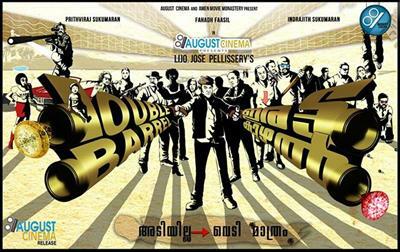 Double Barrel malayalam movie directed by Lijo Jose Pellissery will feature Prithviraj, Fahadh Faasil and Indrajith in lead roles. This big budget movie will be jointly produced by August Cinema India Pvt Ltd and Amen Movie Monastery. Sreenath Bhasi, Shine Tom Chacko, Rajeev, Way Babu and Rachana Narayanankutty, Swati Reddy and Sheetal Menon will give life to other prominent characters. Set in the backdrops of Goa, this action comedy will kick start by the end of May 2014. As movies are being made to entertain, the filmmakers should have to deliver the best product which would attract movie goers to the theatres. As the interest of the viewers change time to time, new wavers should be able to engross them accordingly. Lijo Jose Pellissery is such a gifted filmmaker who proved his mettle right from his debut 'Nayakan'. Riding on the success of box office hit 'Amen', Lijo is gearing up his next venture, 'Double Barrel', featuring Prithviraj, Fahadh Faasil and Indrajith in lead roles. 'Amen' which created tremendous waves in theatres has completed 100 days of run in theatres across Kerala. It is reported to have collected more than 10 Crores which include satellite and other rights. Lijo who has made his own space in the industry is gearing up to bring a different style in filmmaking through 'Double Barrel'. This big budget fun ride will be jointly produced by August Cinema India Pvt Ltd and Amen Movie Monastery. Sreenath Bhasi, Shine Tom Chacko, Rajeev, Way Babu and Rachana Narayanankutty, Swati Reddy and Sheetal Menon will give life to other prominent characters. Sheetal Menon, who has performed in movies like Shahan and David, will be one of the lead heroines. After Seventh Day, August Cinemas will cash for two ventures; Radhakrishnan's 'Saptamashree Thaskaraha' and Lijo's 'Double Barrel'. The shooting of 'Saptamashree Thaskaraha' has already started while Prithviraj would join the shoot of Double Barrel by the end of May. Set in the backdrops of Goa, this action comedy movie will witness very unusual automobiles settings which would really keep the audience intact. Much interestingly, the costumes to be used in the movie will be Brazilian style while the make-up would be totally different and vibrant from head to toe. Heard from the grapevine, Double Barrel will be a wacky comedy entertainer which would follow the style of 'Quentin Tarantino'. The first look poster and early reports about 'Double Barrel' has already pulled the eye balls out. As the young brigades join for a project, the excitement is at its peak leaving much expectation on the shoulders of the director. Meanwhile the much anticipated project 'Anit Christ' is currently put on hold as the production cost is expected to cross the limit. As the movie give prime importance to graphical works, the team has decided to shelve it until they get a good producer who would be willing to do the movie without any compromise.